Salutations and welcome to another installment of our weekly giveaway contest! Last week was a blast with our cool Reservoir Dogs Box Set Giveaway, and the final entries have been submitted and the prize shipped to the lucky winner. This week we’re giving away two great items based on one of our favorite films, Sam Raimi’s Army of Darkness! Protagonist Ash is sent back through time to the year 1300 AD, where he finds himself embroiled in an ongoing conflict between two feudal lords. In an effort to return to his own time, Ash seeks out an evil book called the Necronomicon and accidentally unleashes a horde of undead upon the world. Oops. Now Ash must beat back a mighty horde of demons led by none other than his own evil manifestation! 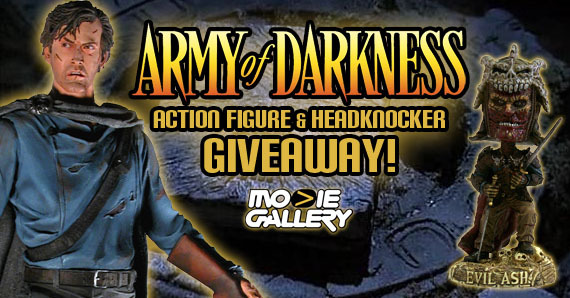 Continue on to learn how to enter to win a highly detailed Ash action figure and fun Evil Ash Head Knocker! “Trapped in time. Surrounded by evil. 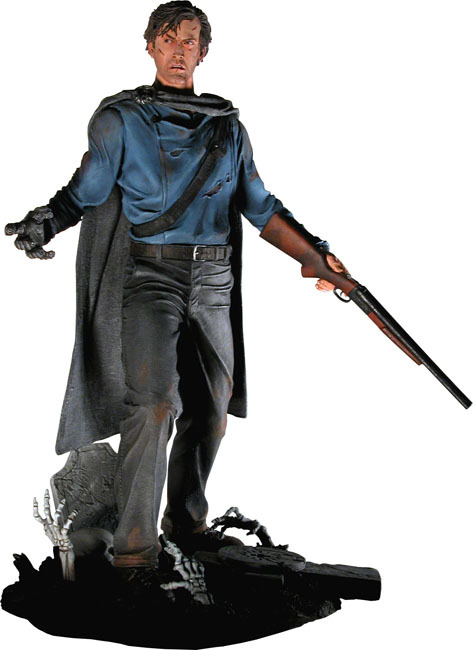 Low on gas.” The Cult Classics series brings your favorite heroes and villains from classic horror, sci-fi and action movies to action figure form! This 7″ scale figure of Ash from the campy horror classic Army of Darkness is ready to take on an entire army of Deadites. He’s articulated for posing and bears the likeness of actor Bruce Campbell. Comes with alternate stretched head, Necronomicon, and shotgun accessories. This evil clone of the real Ash is cast in resin and then hand painted for incredible detail. 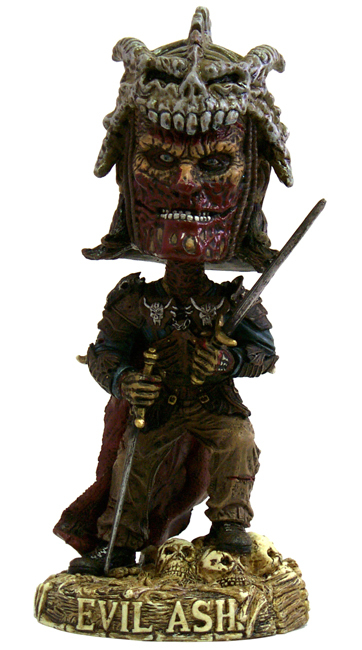 He stands 8″ tall with bobbling head, and is ready to lead an army of the dead, or just look great on your desk or shelf. This entry was posted in Contests & Giveaways, The MG Blog and tagged action figures, Army of Darkness, giveaways, Head Knockers by mgadmin. Bookmark the permalink.